* Hickory Dickory Doc: The mice ran up the clock and Dr. Ivins time in the BL-3 lab in late September 2001 but not as much as the rabbits did in early October 2001. « CASE CLOSED … what really happened in the 2001 anthrax attacks? 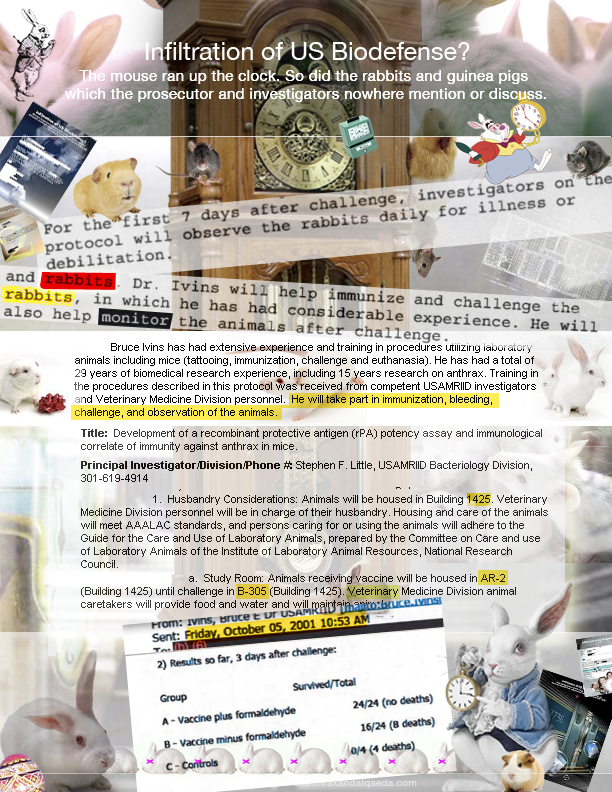 « * 12 rabbits then died on day 3 and 4 and more on day 5; Ivins time then spent the extra time on those nights; AUSA Rachel Lieber got her facts seriously wrong in the investigative summary; DOJ should have required citations to the record. * Hickory Dickory Doc: The mice ran up the clock and Dr. Ivins time in the BL-3 lab in late September 2001 but not as much as the rabbits did in early October 2001. This entry was posted on January 4, 2012 at 6:48 am	and is filed under Uncategorized. Tagged: *** 2001 anthrax attacks, *** Amerithrax, *** Dr. Bruce Ivins, *** FBI anthrax investigation, ivins lab work in fall 2001. You can follow any responses to this entry through the RSS 2.0 feed. You can skip to the end and leave a response. Pinging is currently not allowed. In an email dated September 8, 2001, at 9:31 PM — first produced by the FBI yesterday — Ivins explained that he had been coming in at night for a small animal experiment. He explained that the Bacteriology Division picnic was scheduled for that next Friday (September 14, 2001). Now look at the pundits who claimed that Ivins had no reason to be in the lab at night — and imagined that he was making the deadly mailed anthrax when he was at the Bacteriology Division picnic. ____ came to me a couple of afternoons ago, laughed, and said _________. Then ___ laughed again and walked on. I have no idea what ___ was talking about. The Bacteriology Division picnic is Friday. I’m going to try to make _____________ chocolate-peanut butter cake. The Anthrax Steering Committee _________ I) supposed to meet soon to discuss the progress of various research programs. ____ suggested this Friday, but ___ pointed out it was the day of the picnic. Then ___ said we should all meet at 1 p.m since that would give us a chance to eat and get back. ____ completely overlooked what we might do for the rest of the afternoon). I protested and ___ replied, “How much are you going to eat, anyway?” Now ___ has scheduled it for the 13th, but who knows. I’ve been coming in at night to check micr for an experiment testing the protective of antiserum (to AVA or PA) in mice against a Vollum 1B challenge. So far it appears that there is definite protective effect of the antiserum, except for human anti-AVA IgG. Scott Decker, in his recent book, describes the monkey business at USAMRIID, which included care and checking of animals on nights and weekends. “They brought up a concern we had not anticipated — the monkey colony. USAMRIID housed an extensive collection of nonhuman primates. Living in cages, stacked two and three high, kept in the back corner of the laboratory building away from noise and interruptions were rhesus and cynomolgus macaques and green monkeys. The primates were vital to USAMRIID’s research. USAMRIID used the colony to test the efficacy of new vaccines against anthrax…. B305 was in the B3 suite across from Pat Worsham’s office. Both Little and Worsham describe such studies in their depositions. Wouldn’t it be easy if the secrets of the universe could be known if GAO merely succeeded in reporting on the details of what has been redacted in connection with how Dr. Ivins actually spent his time? In September 2001, before the arrival of the rabbits on September 24, there were mice — lots of mice. Dr. Ivins would assist in the bleeding of the animals as he had done in other experiments. This is a very impressive montage, both artistic and substantial. It is a testament to your perseverance and a model to others to not give up. “I promised you the secrets of the universe. Nothing more.” — Agent K.